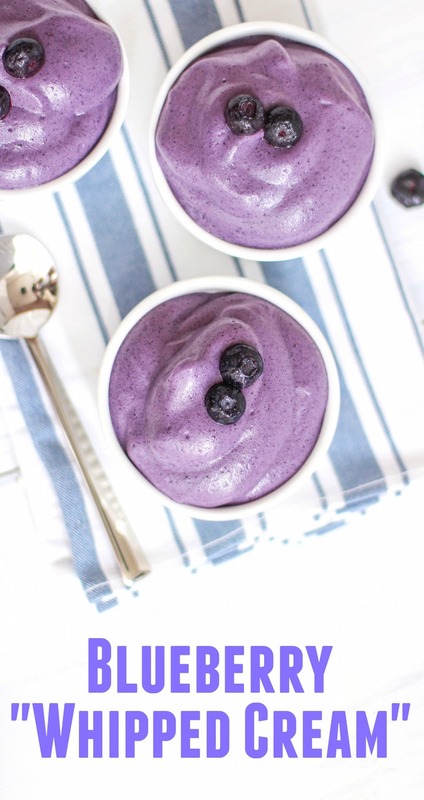 Healthy Blueberry Whipped Cream — super airy and fluffy and delicious. 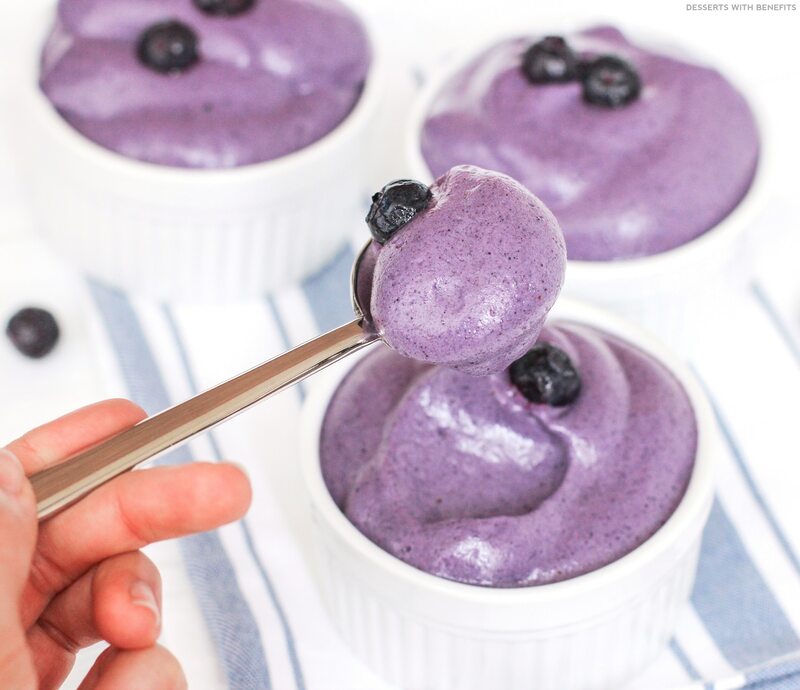 A giant spoonful melts away in your mouth, just like whipped cream, but with a blueberry (and heavy cream-free) twist! Say hello to this magically unique purple amazingness. When you actually see this stuff in the flesh, you’ll wanna faceplant in it. 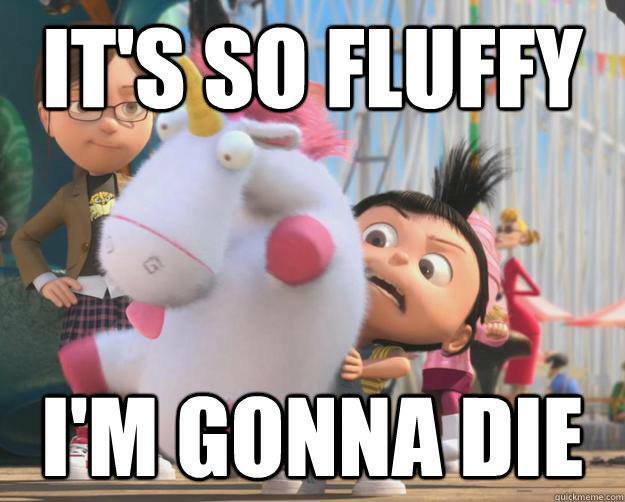 It’s uber light and fluffy, yet firm enough to hold its shape. 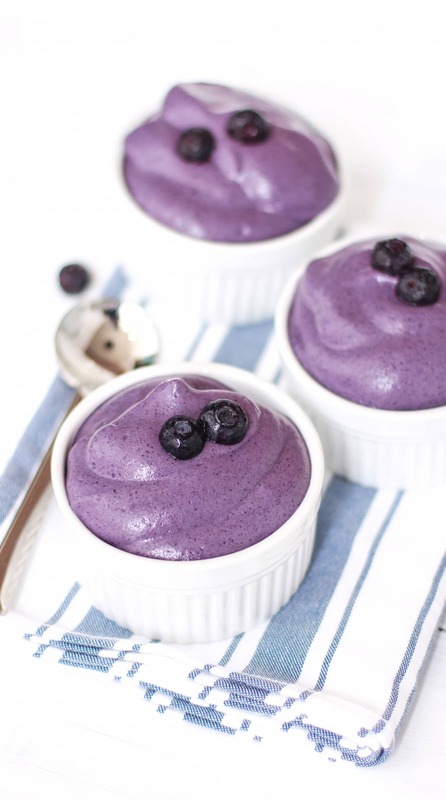 Healthy Blueberry Whipped Cream (sugar free, low carb, low fat, high protein, gluten free). Airy, fluffy, and melts in your mouth like whipped cream! 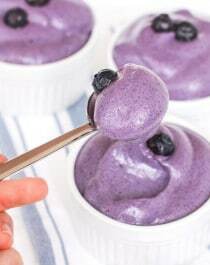 In a high speed blender, add the frozen blueberries, almond milk, protein powder, stevia and ½ tsp of xanthan gum. Puree until completely smooth (I used the smoothie program preset on my Vitamix twice). It should double in size. Pour the entire mixture in a stand mixer bowl. Place the bowl in the freezer for 15 minutes. Fit the bowl onto the stand mixer with a whisk attachment and whip on high speed for 10 minutes. Turn off the mixer and sprinkle in the remaining ½ tsp of xanthan gum. Whip on high speed for 8 minutes. Mixture should be very fluffy and should have increased in volume again. Detach the whisk attachment from the stand mixer and place inside the blueberry mixture. Place the bowl in the freezer again for another 15 minutes. 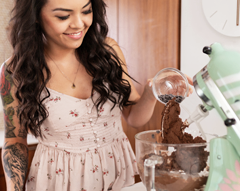 Reattach the whisk attachment and bowl to the stand mixer. Turn on high speed and whip for 7 minutes. Enjoy! For the best results, color, and texture, serve within a few hours of making. YASSSS! 1 cup of this magical fluff has just 30 calories, 3g carbs, and 2g of (naturally occurring) sugar! 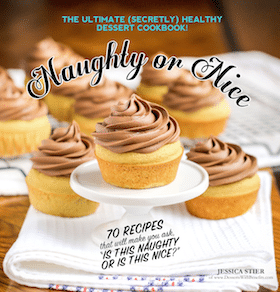 Show pics of your awesome creations on your emails so people want to investigate further…many have recipes with their pics with the email so people can take to kitchen and make. Can I use psyllium husk powder or homemade metamucil instead of xanthan gum? And what can I substitute for the protein powder ( if anything)? I’m not allergic to those ingredients I just don’t feel like running to the store. Thank you! I’m afraid xanthan gum is the secret ingredient in this recipe and can’t be substituted. 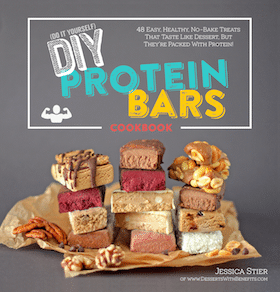 I think you MIGHT be able to omit the protein powder, but it’ll be less flavorful and probably less fluffy. What if you only want to make one serving? I am not sure what I would do with the other nine. And I don’t have a stand mixer. Could I use a regular hand mixer? It sounds delicious! Thank you! Hmmm, not sure how to make just one serving… you’d need to reduce the measurements by 10x and that seems a little odd haha. Also, this recipe won’t work with a hand mixer, only a stand mixer. Hi again I posted before on this recipe. I made this and I didn’t make any recipe subs… except I chopped up frozen strawberries instead of blueberries. And I cut the recipe in half and it made probably 2c. for me, so I think that if you cut the recipe in half it will make just enough for one person ( it didn’t double in size while in my blender ). And I have to apologize because I totally ignored Jessica’s comment saying a hand mixer won’t work, I used a hand mixer and it was still pretty fluffy and firm so I think if you cut it in half you would be able to make it. Oh, and it tasted really good! I used it to top the grapefruit cake! Thanks so much for coming back and letting me know how it turned out. I’m definitely going to try the strawberry variation! I found a recipe I made a long time ago that was really good – only it required cool whip ( or heavy cream whipped to stiff peaks ). I really wanted to make it so I tried making my own. I didn’t refer to this recipe when I made it but I thought about what I remembered of it. So this is a recipe loosely based on yours this is delicious but doesn’t have an authentic cool whip taste. I hope you don’t mind me saying my homemade recipie I just wanted to comment this in case any one comes across it and can use it. Put two cups nonfat greek yogurt, one cup refrigerated coconut milk, one chopped frozen banana, one chopped room temperature banana, vanilla extract, honey, and a few tablespoons of shredded coconut in a blender and blend until smooth. Then add one teaspoon of Xanthan gum and blend again. It should get really thick. Put in the freezer for 15 min. then add another teaspoon Xanthan gum and blend. Finally add half a teaspoon baking powder and blend. I don’t know how this will store. I held its shape but it was a lot denser them cool whip. Greek yogurt is a great idea for a thicker consistency! 1 cup of normal whipped cream is about 821 calories vs. 30 for BLUEBERRY? Yummmsss!